Most people would guess the 11 Premier League goals already scored by Tottenham's Harry Kane in 2017 would make him the leading scorer in English's top four tiers this calendar year. Instead, that accolade goes to Stevenage forward Matt Godden - a man who has found the net 12 times in 12 matches for a form side thumping up the League Two table and who only joined the club from non-league in the summer. Of course, if you factor in Kane's FA Cup hat-trick against Fulham he overtakes Godden, not that it takes off the gloss of being mentioned in the same breath as an England striker. "It's a bit surreal," Godden, 25, told BBC Sport. "Nobody's probably heard of me before this season so it's just nice to put my name out there and stand up. "I'm not massive on social media, I stay fairly quiet, I just like to be nosey and see what's going on in the world. "After a game I just have a check and more often than not this season it's been nice messages. It just makes you feel proud, and you're keeping the fans happy doing what they want you to do." 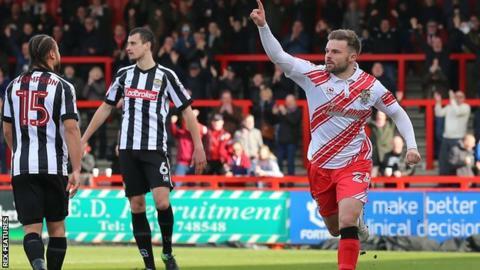 Godden has been an integral part of Stevenage's rise up the table, which has seen them win seven of their last eight matches to go sixth in League Two. The forward credits his team-mates for making the job of scoring much easier for him, but he still has a seemingly insatiable appetite for getting on the scoresheet, annoyed with himself that he failed to add to the two goals he notched in Saturday's 3-0 win over Notts County. "I'm never happy," he said. "Everyone has been asking me what's next after hitting the 20-goal mark. It's about not stopping at 20 and just be satisfied. I need to keep going and get as many as I can." Godden has taken the long road to professional first-team football, having failed to break through at his first club Scunthorpe United, hampered by persistent injury. "Managers and youth-team managers at Scunthorpe, especially Tony Daws, showed a lot of faith in me at the time," he said. "I got a professional contract and they gave me my first chance in League football. To have such an injury-hit few years was disappointing because there were people who had put a lot of faith and time into me and it was unfortunate I couldn't repay them." Despite failing to make a true impact at the Iron, Godden made sure to get some experience in "the more physical and demanding" side of football on loan at non-league clubs such as Brigg, Gainsborough and Tamworth. "That's made the player I am today. I went to some eye-opening places, but that's football. The lucky ones break straight through but football is a game of building your way up. You get reward for working hard in this game. That's what I've found. "You find nowadays that youngsters at 17 or 18 are quite narrow-minded. They want to break in to the first team where they are. If they get the opportunity to go out on loan they want to go to a team in a higher division. "The way I saw it when I was younger was that you can go out on loan, play games, get experience and then maybe your second loan could be to that club you'd have like to have gone first." In 2014 Godden's contract was up after Scunthorpe's promotion to League One, but the Iron still wanted to take up the option in his deal. However, Godden made a decision that not many would think of - dropping down into the Conference South with Ebbsfleet, a club close to his Kent home. "I didn't get released by Scunthorpe, but I had an agreement with Russ Wilcox, the manager at the time, that I really wanted to play football consistently," he said. "They offered me a new contract up there but I felt the time was right to have a fresh start, go back towards home and drop down a few leagues to Ebbsfleet to rejuvenate myself. "If I was going to drop to a side in that division, that would be my first choice. It's not the closest club to me, but with everything going on at Ebbsfleet, the way the owner runs things - for the level it's at it's second to none." Rejuvenate himself he did, and in the second of his two seasons at the club he scored 30 league goals to alert English Football League clubs. After seeing the club's facilities, which are "up there with if not better than some Championship sides" in the words of Godden, he was sold on Stevenage, becoming Darren Sarll's first signing as permanent manager. A slow start to the season followed. Stevenage were 22nd in October, but Sarll is a man for whom graft has no bounds, candidly admitting that he struggles to switch off from the day-to-day life as a football manager. "I've never known a manager to be so hardworking," said Godden. "If he gives us a Sunday off, you know for a fact he's probably watched the game twice over from the day before. "He's a really hardworking manager on and off the field. That's starting to pay off in games. Everyone knows how he wants to play and he's got us playing in a way that we're all enjoying and thriving on and that's why we've picked up our results."